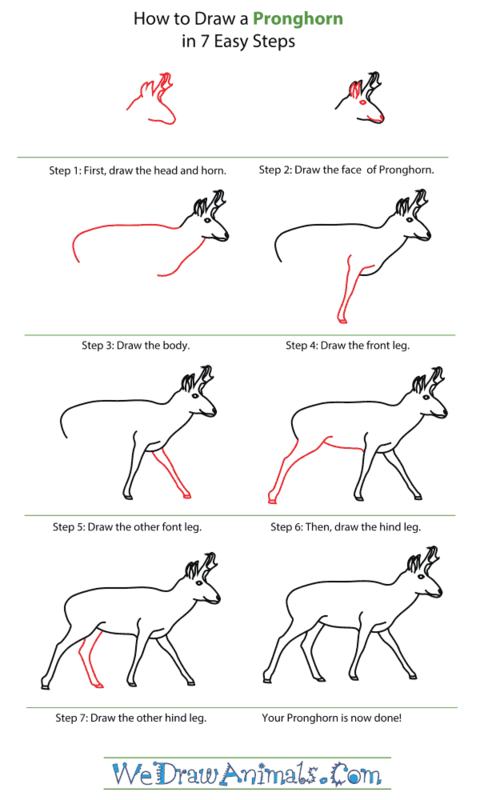 In this quick tutorial you'll learn how to draw a Pronghorn in 7 easy steps - great for kids and novice artists. 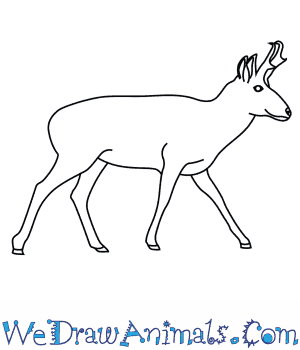 At the bottom you can read some interesting facts about the Pronghorn. 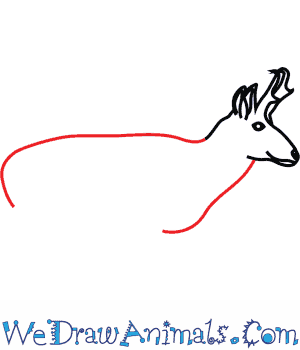 Step 1: Let's draw a pronghorn! For the head, draw an oval shape for the face and some triangular shapes for the ears. 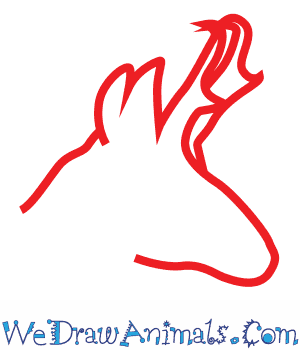 Draw the back of the horn curving it back and the front of the horn curving it toward the front. Make sure they are pointy on both ends! Step 2: Draw a tiny circle at the front for the nose and a short line for the mouth. 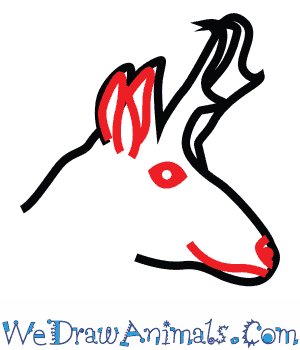 Add a circle for the eye and outline the ears some more. Step 3: Trace a long curved line across the back and make sure it loops around again. Then trace a shorter line going down the front, curving it toward the inside too. There's the body! Step 4: Draw a long, thin front leg, with a short line going across the bottom of the paw. Step 5: Trace the other front leg like you did the first! Step 6: Trace a line going across the bottom for the belly, then finish the line by drawing the hind leg. Make the thigh a bit bigger than the bottom half of the leg. 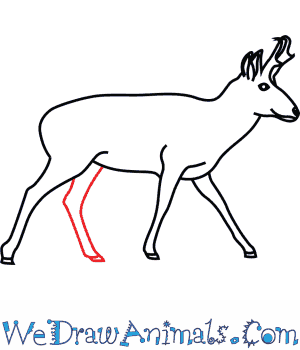 Step 7: Trace the other hind leg, with the top half of the leg bent toward the back, and the bottom half angled toward the front. 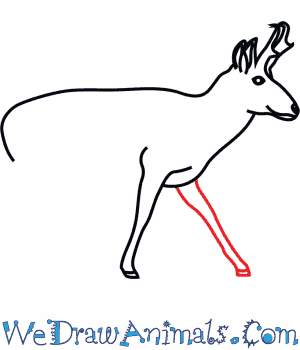 That way, it looks like your pronghorn is really walking! There's your pronghorn! The Pronghorn can be found in North America, and while it is not an antelope, it is commonly referred to as one, due to the fact that it looks so much like antelopes in the past. The Pronghorn’s most dangerous enemies include coyotes, wolves, cougars, and bobcats. Baby Pronghorns have been prey for Golden Eagles in the past. A Pronghorn’s “horns” are actually flattened bones that grow out of their skull. The tips of their horns point forward, which is how they got the name “pronghorn,” because their horns look like prongs. Male Pronghorns mark their territory by spraying it with the scent glands that are located on either side of their heads. 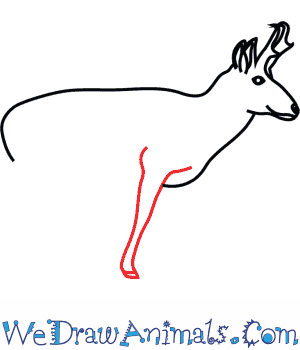 Deers do not have gallbladders, but Pronghorns do. Pronghorns also have very big eyes that can actually see a 320-degree field of vision. One of the things a Pronghorn does best is run. Because the Pronghorn is so incredibly fast, it can easily get away from most of its enemies. The Pronghorn is actually believed to be the fastest animal on land in the entire Western Hemisphere. Its top speed, though, is different for each individual Pronghorn. The fastest it has been measured to go is 55 miles per hour, so it could keep up with cars on the highway!